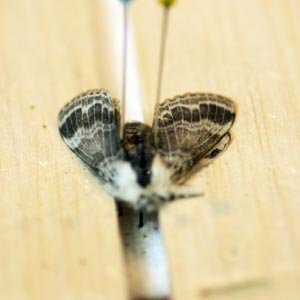 The methods I use when collecting insects are two. For larger specimens, I use glassine envelops and insert the specimen with the wings folded. For smaller specimens I use either glass or plastic vials. I like glass for moths because they seem to loose less scales prior to pinning (remember to wash out the vials occasionally to keep them clean). I try to have a cooler with me and put the specimens into the cooler as soon as I can and get the specimens cooled as this stops them from moving a lot. When I get home, I decide whether to pin immediately or the next morning. With butterflies, I like to pin right away as they tend to dry out quick. I put the specimens into the freezer for about an hour to kill them prior to pinning and/or spreading. With moths I usually put them into the refrigerator over night and then into the freezer in the morning. 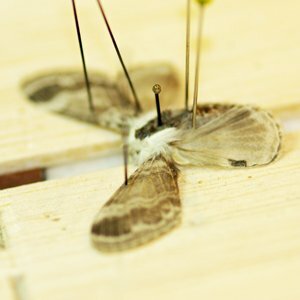 Supplies for pinning specimens can be purchased from Bio-Quip ( www.bioquip.com ) or another supplier. 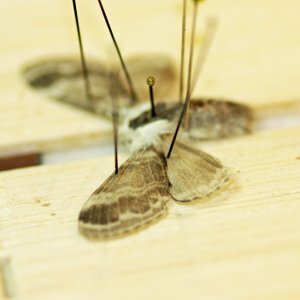 The supplies include a spreading board ( spacing between depends on size of moth being spread), insect pins, straight pins, and some kind of paper like wax paper cut into strips. A pair of tweezers with wide tips (1/4 inch) are nice to pick up the moths. 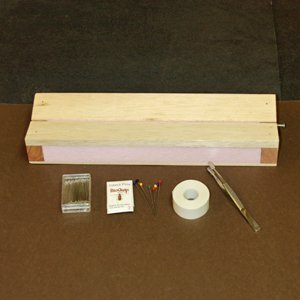 Pinning boards can be made with 1 inch pink form or similar density and balsa wood from your local hobby shop. Try to get the wood that is for making wings of airplanes as this has an angle that works well to put a little dihedral into the wings. This will keep the wings above flat even if they droop a little after removal from the boards. Also take a straight pin and test the wood for softness. If you can't push the pin in easily, then you do not want it. 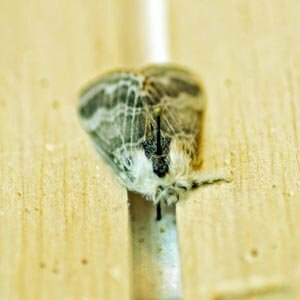 The spaces between the boards is determined by the body size of the moths or butterflies that you are pinning. The body should fit in the space with some movement but not a lot to keep it from moving while spreading the wings. 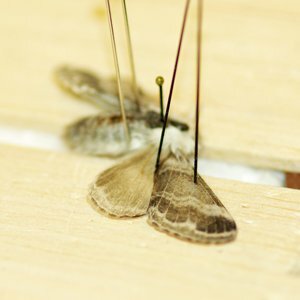 The following instructions are for pinning butterflies and moths. Other insects are similar except in most cases the wings are not spread. 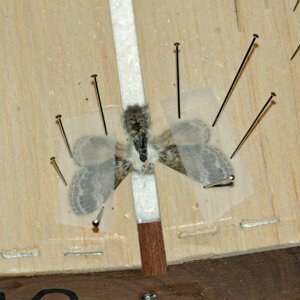 To start spreading your specimens, insert a pin into the center of the thorax perpendicular to the body of the insect. Next complete the pin insertion by placing the top of the specimen 1/4 inch from the top of the pin. 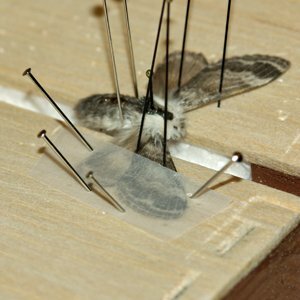 Place the specimen into a spreading board, with the wings touching the wood. 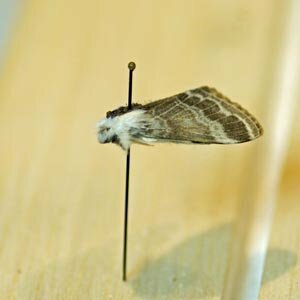 Place a pin on both sides of the abdomen to keep the specimen from turning while spreading the wings. Use a small pin to pull the forward wing till the aft side of the wing is at a 110 degree angle to the body. Shove the pin into the wood to keep it in place. Note that there is a hard vein running along the front of the wing. Place pin behind this vein to keep from tearing the wing. Take a second pin and pull the hind wing forward till it is just under the front wing. Push pin into wood. Perform same step on left wing as on right wing. Apply paper to left wing. 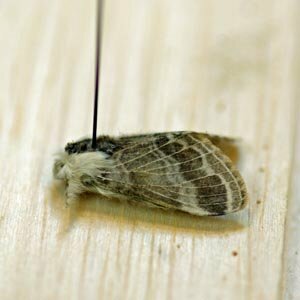 Remove pins holding abdomen and allow specimen to dry for at least two weeks before removing. This will keep the wings from drooping. 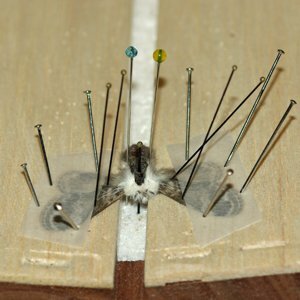 This photo shows a specimen that has been pinned, spread on a board and left for a couple of weeks to dry. It is then removed and a label is attached showing where, when and who collected the specimen. With the database I use to track my specimens, it also adds a catalog number. After this the specimen is identified. The label should contain the following information: Country, State, County, Location by name (may only be able to give a close reference like a city), the GPS coordinates or township data from something like a Sportmans Atlas, who collected the specimen and the date. The specimen is then put in the proper drawer. 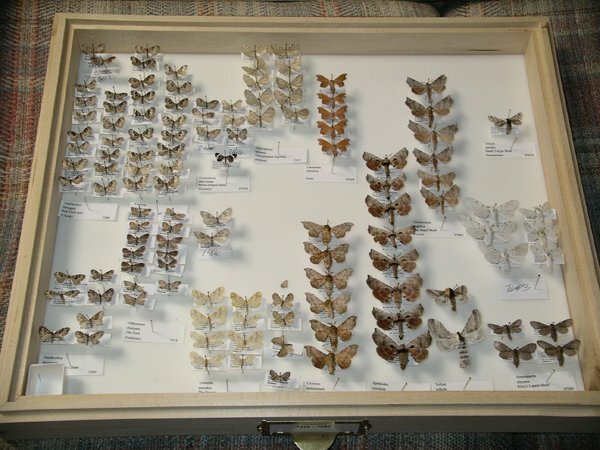 My moth specimens have been sorted by Hodges number. This is a number which was assigned to the species by Ronald Hodges in 1983. 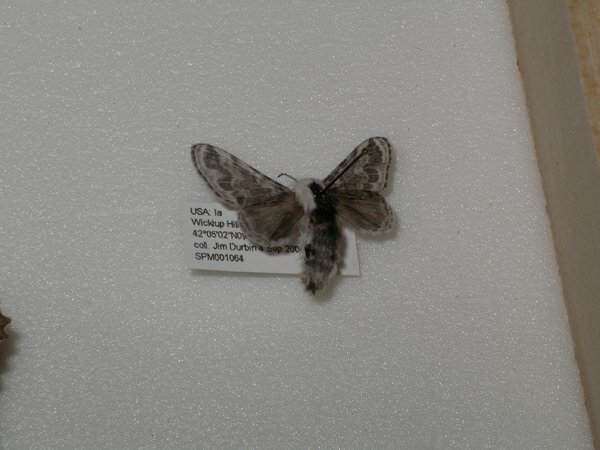 He assigned a number by taxonomic order for all Lepidoptera in North America, north of Mexico. 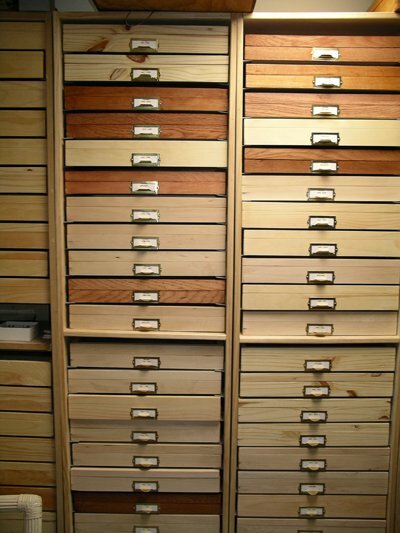 It is useful in that you have some method of sorting species. Without the number, it would be in alphabetical order which doesn't follow any taxonomy method. While changes have made some of the numbers out of sequence by the new taxonomic data, it still provides an order. The drawers are then placed in cabinets. The cabinets are in my basement which is normally dark and the temperature stays at about 60 degrees. Light and temperature will cause specimens to lose their colors. If keeping a collection, try to keep the specimens out of the light. Also put some kind of pest strip in the drawers to keep out bugs. 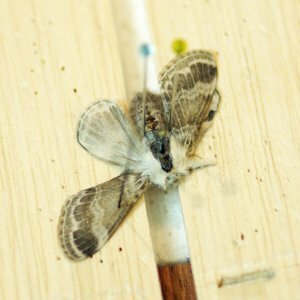 There is a beetle (dermestid beetles known as carpet beetles and buffalo bugs), that can get into your drawers and will eat your specimens.